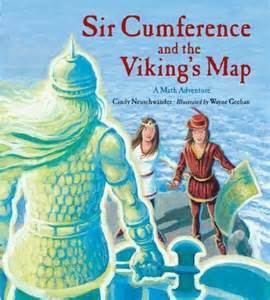 In Sir Cumference and The Viking’s Map, cousins Per and Radius get lost in the forests of Angleland, but find a Viking’s treasure map that teaches them to use coordinates. In Sir Cumference and the First Round Table, all the knights are meeting with King Arthur to discuss what to do about the Circumscribers, who have been seen at the edges of Angleland, possible arming for war. They start out with a long rectangular table, but people at opposite ends have to shout to be heard. 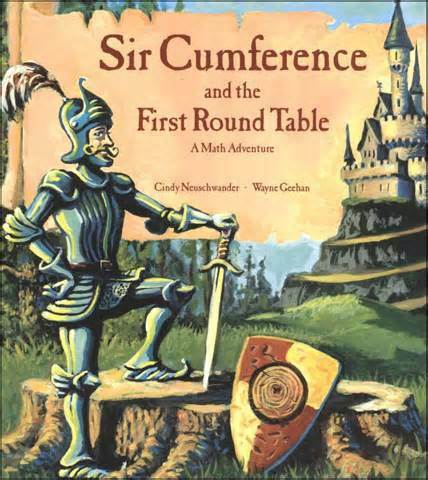 Then Sir Cumference discusses the problem with Lady Di, and has his carpenter Geo of Metry reshape the table into a square. This is better, but no one likes being at the corners. They eventually come up with a circle, after many other shapes are tried and rejected. The circle is as wide as Lady Di’s reach, so King Arthur decrees that the span of any circle shall henceforth be known as the diameter. See, isn’t that cute? Neuschwander uses wordplay to create heroes and quests in each story, and it’s a great combination that immerses kids in geometry in a memorable, entertaining way. There are about seven or eight of these books, but I see just from checking her name, that Neuschwander has oodles of other math story books as well. We’ll be checking these out for sure!